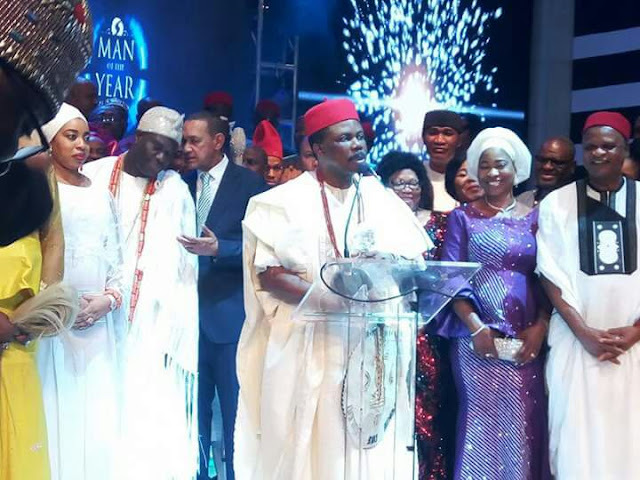 The Governor of Anambra State, Chief Willie Obiano has dedicated the Silverbird Man of the Year Award conferred on him last night to the youths of Nigeria. Giving his acceptance speech on a night that he had the attention of the nation’s political and business elites to himself; Governor Obiano showed strong concerns about the nation’s future by symbolically dedicating his honour to the Nigerian youths who look up to the present crop of political and business leaders for direction and inspiration. The governor charged his colleagues in leadership positions in every stratum of the society to strive to do a new thing in the lives of the youths, emphasizing that it behoved on him and his colleagues to touch the lives of the youths of this country. “We can achieve this by the way we conduct ourselves, by shunning corruption, by showing integrity, by showing that hard work pays and by showing that we are prepared. You cannot just jump into something that you are not prepared for,” he suggested. To drive home the point that his concerns about the youths were not an empty rhetoric, Governor Obaino reminded the audience that he still held the record in the current dispensation for appointing Nigeria’s youngest commissioner into his cabinet. Presenting the prestigious award to him, the Arole Oduduwa, the OOni of Ife, Oba Adeyeye Enitan Ogunwusi Ojaja II declared that he was proud to be associated with Governor Obiano whose achievements stood out as testimonials of his service to his people. Also speaking at the ceremony, the Chairman of the Silverbird Group, Senator Ben Murray Bruce reminded Governor Obiano that he emerged the Silverbird Man of the Year because Nigerians voted for him. Pointing out that it was impossible for an unpopular candidate to win the Silverbird Man of the Year award; Senator Bruce explained that the process was based on a popularity contest involving all the nominees. Hear him, “All the past winners were subjected to a contest and based on that competition which the audience can verify at any point in time, they were chosen. We do research across the country. For instance, the wife of the Kebbi State governor, I have never met her in my life. Never! The research team went across the entire country. When they came back they said, there is a lady in Kebbi who is shining and excelling and she is doing amazing things for the people of that state, and that is why she’s here today. “Now, that goes for everybody who has received our award in the past and in the present. Today, I did my research before the competition and wrote several articles about Anambra. And in the articles I wrote, what I came about was agriculture, health, education, security, the things we talk about every day. So my research team kept going back to Anambra. I wrote several articles. So, if I write articles and you see your name in Thisday as governor or minister or president or ex-president, it’s not because I know you. I don’t have to know you. I will always write the truth. And you don’t have to be my friend,” he further explained.